Scientists are a step closer to reconciling a mystery on Mars, a cosmic oddity centered on Martian rocks and pieces of the Red Planet discovered on Earth. The composition of meteorites long suspected to come from Mars have confounded scientists for a long time. Planetary scientists know that rocks sampled from the Martian surface are high in nickel, yet the Martian meteorites (known as the SNC meteorites) happen to have significantly less nickel than those other sampled rocks. "The Spirit rover in the Gusev crater found nickel concentrations five times as high in the crater than in the meteorites," Bernard Wood, a geologist at the University of Oxford and lead author of the study, said. Wood and his team found that oxygen is a key element that could explain the chemical components of these rocks. 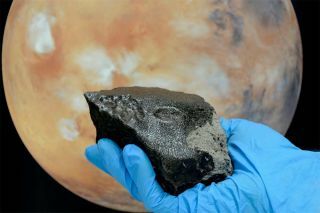 The older rocks sampled by the Spirit rover (in operation on Mars until 2010) formed under more oxygen-rich conditions, while the young meteorites were crafted in a low-oxygen environment, according to Wood's model. "[In Wood's model] the upper mantle of Mars was more oxidized than the lower mantel, so when you partially melt the upper mantle, you get these ancient rock compositions and when you partially melt the less oxidized lower mantel, you get the Martian meteorite compositions," said Hap McSween, a planetary geologist at the University of Tennessee who is unaffiliated with the study. When the volcanic liquids that produced the SNC meteorites were formed under low-oxygen conditions in Mars' interior, sulfides remained behind as the liquids rose, leaving nickel trapped in the deep interior. The volcanic rocks were therefore low in nickel, Wood said. The surface rocks, found in the Gusev crater, were formed in a high-oxygen environment in Mars' interior where the sulfides — together with their nickel — dissolved in the volcanic liquid. The rocks are therefore nickel-rich. The rocks in the Gusev crater formed more than 3.7 billion years ago while the SNC meteorites date back 118 million to 1.3 billion years, Wood said. This plays into the theories scientists have about Mars' past. "It's still consistent with one idea of Mars, which is that it's sort of wet and warm … and the atmosphere was oxidized very early on, that's certainly an idea that's been kicking around for a long time," Wood told SPACE.com. Wood applied his knowledge of Earth's geological processes to understand what might be happening on Mars. "On Earth, we know that we cycle oxygen rich rocks into the Earth's interior through plate tectonics, through so-called subduction," Wood said. "The oxidized surface materials are pushed down into the interior and so we argue that’s a plausible explanation for Mars." Although that explanation could account for why the older but oxygen-rich rocks were found in the upper mantle while the oxygen-poor rocks came from a deeper part of Mars' interior, McSween doesn't think there is necessarily evidence to support a tectonic past on Mars. "Although there are some suggestions that Mars might have had plate tectonics at some point, there really is no evidence for it, but this is at least a suggestion that something presumably cycled oxidized materials from the surface back into the upper mantle and maybe that's in the cards here," McSween told SPACE.com.